The zombie apocalypse is here! Can you survive and possibly save the human race from extinction? Find out in the thrilling new The Dead Escape slot by Habanero. This spine tingling game offers 5-reels and 30-lines of action with lines that pay both ways. Activate the bonus feature which awards 15 free spins where you'll join the family in battling the zombie horde in a fight for survival! The zombie apocalypse is here! Can you survive and possibly save the human race from extinction? 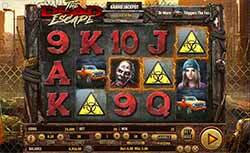 Find out in the thrilling new The Dead Escape slot by Habanero. This spine tingling game offers 5-reels and 30-lines of action with lines that pay both ways. Activate the bonus feature which awards 15 free spins where you’ll join the family in battling the zombie horde in a fight for survival! In a gory display of imagery and frightful sounds, you’ll be on knife’s edge while waiting for your pay day. The graphics are incredibly well done and put you in the centre of the apocalypse. The zombie man is the game’s wild symbol and when he is landed on a line adjacent to the father or daughter you’ll activate the duel feature. This game is reminiscent of an episode of The Walking Dead or the hit video game, The Last of Us. Overall, it’s an excellent release and one that can reward you immensely… if you can survive! Zombie Wilds – The Zombie man is the game’s wild and substitutes for all other symbols except the scattered trucks. You can find this symbol on reels 1, 3 and 5 in normal mode. Scattered Trucks & Free Games – The orange truck is the game’s scatter symbol and will award you instant prizes when landing 3 or more anywhere on the reels. Additionally, landing three or more on the reels will earn you 15 free spins instantly. If during free games you land a gas can, you will earn an additional free spin! Duels Feature – Duels can occur in either the base game or free games. This feature is triggered when either the father or daughter symbol appears directly adjacent to the zombie wild on the same row. A spinning coin will reveal the result of the duel with results being either “dead” or “escape”.